Room Eight | Governor Cuomo is riding high. Governor Cuomo is riding high. Normally this time of year with the budget and all, NY Governors are running for cover, but not Cuomo. The latest Siena College Poll out Monday morning shows Cuomo with the highest approval rating ever for a governor during six years of the college’s statewide polling. A sky high 77 percent of New York voters, despite the problems of the economy and the possibility that 10,000 state workers may be laid off, feels Cuomo is headed in the right direction. That’s not all. 70 percent of Republicans and even 68 percent of conservatives view Cuomo favorably. The news is so good for Cuomo that even though voters express opposition to his proposed health care and education cuts, they still back his budget plan, 72-25 percent. As one might expect, according to the poll, Republicans support the budget (which contains a lot of cuts) more than Democrats, and upstate supports it more than NYC residents. The poll also found that with Cuomo in control, New Yorkers think for the first time since 2007 that the state is heading in the right and not the wrong direction. Wonder if this is more a slap at David Paterson and NY voters are glad he's gone? “The honeymoon continues,'' said Siena's Steve Greenberg. “Despite what Gov. Cuomo described as a painful budget – or maybe because of it – 77 percent of voters say they have a favorable view of Cuomo, compared to only 16 percent who view him unfavorably,'' he continued. 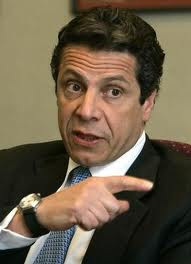 But the news is not too good for other leaders in Albany. In sharp contrast, Assembly Speaker Sheldon Silver (D-Manhattan) is viewed favorably by just 19 percent of voters and negatively by 41 percent. Senate Majority Leader Dean Skelos doesn’t do any better. His favorable/unfavorable numbers are 11-17 percent.